There are many potentially unwanted and harmful programs out there that arrive bundled with freeware. TermTrident is one of such applications, and it is very likely that users are not aware of the fact that this adware program enters their computers together with some program they install willingly. We are not trying to say that TermTrident is a malicious computer infection, but if you care about your system’s security, you will remove this program at once. Adware applications are often employed by cyber criminals to promote corrupted commercial content, and if you are not careful enough, it might lead to a severe malware infection. Our security researchers managed to find the official website for TermTrident. You can easily access it at termtrident.com. It looks user-friendly and is easy to navigate, but one closer look at it is enough to understand that the web page is highly dysfunctional. The homepage does not offer you a direct download link for TermTrident. It also provides you with the most basic information on the tool, vaguely telling you that the application can enhance your web browsing experience. That kind of promotional tagline is used by multiple adware and potentially unwanted programs, and you should not fall for this. Granted, it is not possible to download TermTrident from the official website, so how does the program manage to enter your PC? We have mentioned the answer already: bundled downloads. This simply means that the program is included in a freeware setup file that is distributed by some third-party installer. Since TermTrident is closely related to WordShark, Highlightly, SearchSnacks, WordProser, and other similar applications, it is only natural that the program employs the same distribution network as its predecessors. We know that this application comes in software packages via the Amonetize installer. At the same time, it also implies that TermTrident is not the only unwanted program on your computer. The Amonetize installer is known to distribute the Multiplug family adware as well, so you can be sure that you have multiple adware applications installed on your system, and they are currently monitoring your online activity to expose you to commercial content. It is very likely that TermTrident was installed along with VuuPC, PicColor, PriceLess, and many other unwanted programs. When you have a handful of unnecessary application, you can be sure to experience an onslaught of annoying pop-ups and even potential redirections to unfamiliar websites. As far as TermTrident is concerned, this program displays in-text ads, pop-ups, and other types of advertisements on any website that you visit. In other words, the adware program directly affects your browser, and you can no longer surf the web the way you were used to. On top of that, TermTrident also promotes third-party content that might be associated with malware distribution and other cyber criminal activity. This just proves that you should not keep this application on-board. You can uninstall TermTrident via Control Panel, but do not forget that there are many other adware programs you have to remove as well. If you cannot recognize potentially unwanted applications, you can always scan your PC with an antispyware tool and then invest in a licensed version to delete the potential threats automatically. Acquiring a computer security tool of your choice is always a good idea because that would also secure your PC against similar intruders in the future. Open Uninstall a program and remove TermTrident. Go to Uninstall a program and remove TermTrident. 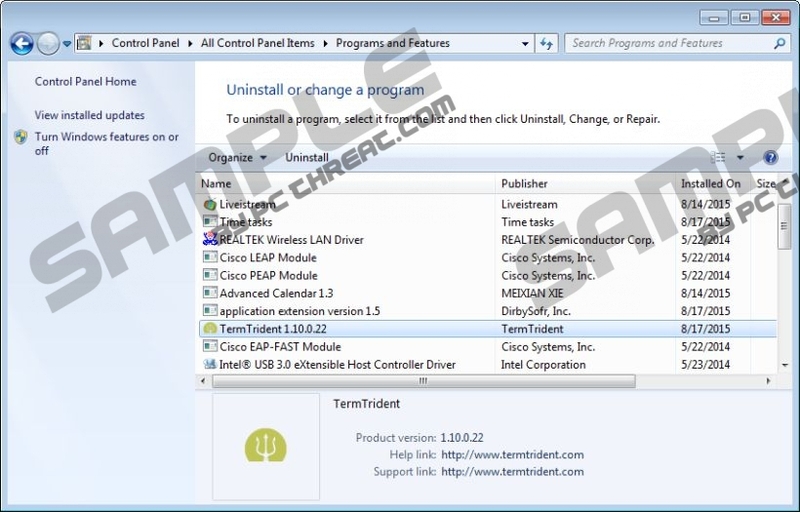 Select Add or remove programs and uninstall TermTrident. Quick & tested solution for TermTrident removal.